In September 2014, a new National Curriculum was implemented in schools across England. Schools are now expected to follow new programmes of study where all children are expected to meet the outcomes specified for each year group. Here at St Richard’s CE Primary School, we have worked together to respond to the new expectations of this curriculum to ensure that we provide a curriculum that is engaging as well as educational. At St Richard’s we recognise that strong foundations in English are necessary for children to be able to access all areas of the curriculum and for their future lives. Therefore we ensure that English skills are developed through all curriculum subjects as well as through discrete English lessons. Great emphasis is placed upon developing children’s spoken language, as this is crucial for learning to read, write and to be successful in all areas of learning. Children learn how to communicate successfully with others and to express their ideas using a broad vocabulary. They learn to speak in a variety of situations, for various purposes and for a range of audiences. Our approach to reading at St Richard’s is to develop fluency, comprehension and a love of reading. We are a CLPE Power of Reading School. This approach uses high quality fiction, non-fiction and poetry texts to engage children in both reading and writing for pleasure through exploratory and creative experiences. The project has been running for over 10 years in schools all over the UK and is proven to not only raise academic standards, but also children’s love of literature. By sharing books and stories from when they join us, children are actively encouraged to read and write for pleasure and enjoyment. Shared reading: Children across the school take part in regular shared reading, where an adult reads to the class. Guided reading: All children take part in daily guided reading sessions. We follow a bespoke scheme called ‘READS’ where children complete an activity for each letter of the program. They will be guided by their teacher once a week. In addition to this they will take part in a weekly guided reading group with the teaching assistant where they will complete a structured activity based on the text they are reading. Independent reading: Children get regular opportunities to choose and read alone or share books and to use their class book area. Phonics: Our Reception, Year 1 and 2 classes take part in daily phonics sessions. For more information please click here. Resources: Book banded reading resources are used across the school. Children work through each band before becoming a ‘free reader’ where they are supported in choosing their own books. Reading at home: Each child has a reading record book which logs books that they have read and comments about their reading. Pupils, parents and teaching staff may make comments in this book. Children are encouraged to share or read a book with their parents at home every day. Library: Every child visits the school library and has regular opportunities to borrow a book. Teachers show the children how to use the library effectively and offer guidance upon book choice. We encourage children to write for a range of purposes and audiences using a high quality text as a stimulus. They learn the rules of punctuation and grammar, through daily 15 minute sessions, so that they can express their ideas, opinions and views with clarity and confidence. Regular attention is given to spelling, presentation of work and handwriting. Learning through the use of one high quality Power of Reading text per half term. Writing linked to Topic and Science work. Clear ‘Success Criteria’ used to enable children to self-assess and improve their writing. A fortnightly independent writing activity where children have the opportunity to apply their writing skills in an extended piece of writing. Spelling: The school has recently adopted the Read, Write Inc. spelling program by Ruth Miskin. This will be taught daily with a spelling test every Friday. It is very important for children to learn their spellings at home as they go through each spelling pattern to successfully secure their understanding. We believe a sound understanding of Mathematics is essential to the development of our children at St Richard’s. Teaching is designed to develop the children’s ability to manipulate numbers and mathematical concepts fluently and enable them to become independent problem solvers who can apply their mathematical knowledge and skills in a variety of contexts. We strive to create a climate where all children have a positive attitude towards mathematics , so that they enjoy the subject and study it with a sense of achievement. Maths is taught daily throughout the school and where possible, links and opportunities to use and apply knowledge and skills are made across subjects and curriculum areas. Resources and visual images are used regularly to support the children’s understanding of mathematical concepts. We place a strong emphasis on mental maths to develop basic number skills. All children are expected to be secure with their times tables by the end of Year 4. Children will learn to read and interpret mathematical symbols and use pictures, diagrams, jottings and formal written methods to support their thinking. We also encourage children to reason mathematically by explaining decisions, methods and results using mathematical language. It is important to their understanding of maths that the children see maths in their daily lives both inside and outside of the school environment. Children benefit when parents take a keen interest in their mathematical learning. At home children should practice their tables and mental maths skills at every opportunity as well as complete homework activities set by their class teacher. Children also benefit from dice and board games, card games, talking about pocket money, pointing out shapes and patterns, looking at time and even checking out the football or rugby scores. There are also a wide range of educational games online and apps available to download for free on tablets such as iPads. Here at St Richard’s CE Primary School we provide a creative curriculum based around the Cornerstones Curriculum, a nationally recognised approach for delivering outstanding learning opportunities for children. The Cornerstones Curriculum is a creative and thematic approach to learning that is mapped to the 2014 Primary National Curriculum to ensure comprehensive coverage of national expectations. Our curriculum is delivered through Imaginative Learning Projects (ILPs) or Topics which provide a rich menu of exciting and motivating learning activities that make creative links between all subjects and aspects of learning. Cornerstones also provide a rigorous essential skills framework that outlines the end of year expectations in all subjects. These essential skills are tied to activities and are age related so that our teachers can track children’s progress and identify their individual learning needs. Children will progress through four stages of learning in each ILP/Topic – Engage, Develop, Innovate and Express. Engage – Memorable experiences are planned and delivered to hook learners into their new topic. Interesting starting points are used to set the scene and provide the context, as well as provoke thought and interest. Children are encouraged to be curious and ask questions. Develop – The children are taught the knowledge they need to gain a depth of understanding. The are also given the opportunity to learn and consolidate new skills. Teachers will provide the children with creative opportunities for making and doing, whilst continuing to develop Reading, Writing and Mathematics knowledge and skills across the wider curriculum. Innovate – Teachers will provide imaginative problem solving scenarios that promote creative thinking, independence and enterprise. This will enable them to assess pupils’ application of previously learned knowledge and skills. Express – At the end of the ILP/Topic, teachers will encourage reflective talk by asking questions. They will provide opportunities for shared evaluation, celebrating successes and identifying next steps for learning. Parents are encouraged to support children’s learning across the curriculum through termly workshops, where family members are invited to come into school and support the children with a hands-on activity linked to their current ILP/Topic. 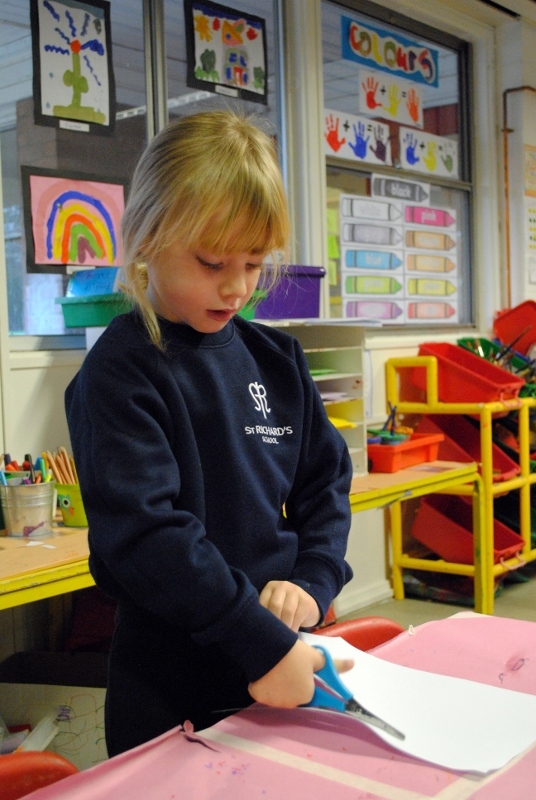 Children are also given home-learning projects to encourage them to independently take their learning further. More detailed information about the ILPs/Topics covered by each year group can be found on the Curriculum Overview tab. As a Church of England school, we place a great emphasis on Christianity and our Christian ethos throughout our RE teaching and during class and whole school Collective Worship. However, RE is also taught with the aim of widening the children’s understanding of the beliefs and faiths of others, both within the school and in the wider world. We believe that this will help promote tolerance and unity within our community and will give our pupils the opportunity to develop a thoughtful and considerate approach to people from all faith groups.